Victor is a Master in Management Class of 2020 student. Hi, I’m Victor Lanckriet! I’ll be 22 when I start my masters and I’m from Belgium. I have quite a bit of international experience, having studied in the UK and worked in Belgium, the Netherlands, Bulgaria and Brasil. 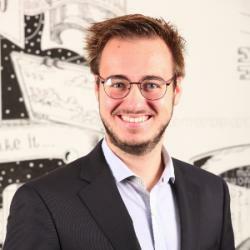 I have entrepreneurial aspirations and hope to get to know a lot of interesting people during my studies at Frankfurt School of Finance and Management. I am excited to continue my international adventures in Frankfurt! There were two very important points I was looking for in my potential Masters programme. I wanted to further develop my international experiences and entrepreneurial aspirations. With more than 20 nationalities on the course, I am sure to have an international experience. A considerable amount of students also go on to work in the start-up atmoshpere, which is something that I am aiming for as well. Lastly, I also really like the idea of the option to study abroad. Frankfurt School has some great partner universities, in countries such as China, the USA and South Korea. I am most looking forward to meeting my fellow students. I firmly believe that colleagues can make or break an experience, especially when studying. Good fellow students means better class discussions, better collaboration and more fun! I am therefore very excited to find out who I will be sharing this important and interesting part of my life with. I want to take the Digital Business concentration. I believe that digitilisation and automation in business already is ubiquitous and it’s something that every single person should prepare him- or herself for. I recently did a programming boot camp, which was meant to start to prepare me for a business world that is becoming increasingly digital and automated. I think the Digital Business concentration will help to further prepare me for the world out there. For further information on the Master in Management, feel free to contact masters@fs.de.